Handy Backup license allows you to use the software on one computer only*. 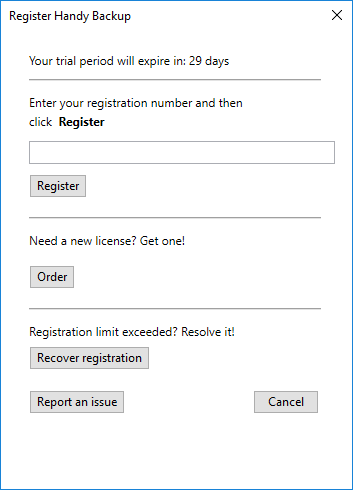 After you have used your registration key on one PC, any attempts to re-use it on other computers will fail. *Note: In case of Server edition, you register only the Server component, independently of the key of Workstations you want to back up. There are situations (e.g. hardware upgrade) when you may want to migrate your license to another computer. You can made it by one of two ways described below. You can reset your registration key manually, using the registration management page. It is a quick and simple action. Please follow the instruction to migrate your registration key from one computer to another. Send a request to support@handybackup.net. Include your registration key, your name, and information about when you purchased the software. Note: Make sure you give us enough information to find the correct record in the registration database. Generally, we identify customers by name and e-mail address used during the purchase. Our support team resets information about your registration key, so you can use it to register the program on another computer. When you receive an e-mail with confirmation, re-register the program on the new computer under the same key. To register a migrating copy of Handy Backup, please open the Help menu section, and use the Enter your serial key... option to enter the registration code. Then click on a Register button to move your license. For detailed instructions on registering, please see Registration.